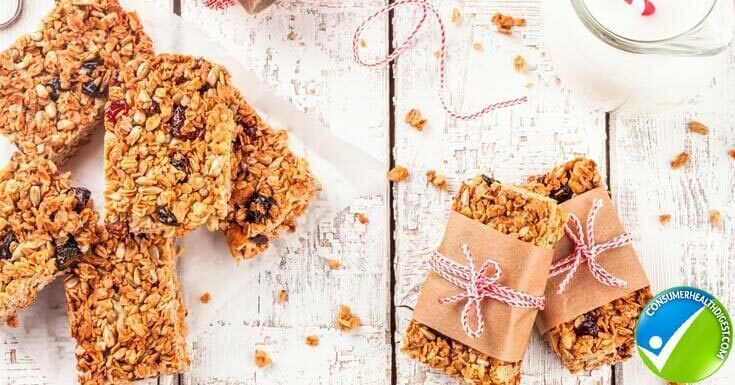 Believe it or not, a huge segment of the population is unsure about what to eat, according to the International Food Information Council. Specifically, consumers continue to be confused about dietary fat in general and need clarity on the importance of essential omega-3 fatty acids in their diets. A basic overview of dietary fats is necessary to then discuss the specifics of omega-3 fatty acids. Let’s look at the major categories of dietary fats. Dietary fats have been categorized as “good” and “bad” for decades, and although I don’t like using such generalizable terms, they seem fitting here. Saturated fats are typically solid at room temperature (think about your butter dish on the kitchen counter) and occur naturally in animal products such as beef or pork. Saturated fats can also occur in plant foods including coconut, palm kernel, and palm oils. Foods such as doughnuts, pastries, and piecrust contain high amounts of saturated fat. The Dietary Guidelines for Americans 2015-2020 report shares that the primary sources of saturated fat in our diets are mixed dishes with cheese, burgers, pizza, and pasta. Trans fats also fall under the “bad fat” category. Very small amounts of trans fat occur in meat and dairy products naturally, but it was the hydrogenation of vegetable oils that led to extremely high amounts of this heart-damaging fat in the typical American diet. Industry changes have removed much of the trans fatcontent from our foods. 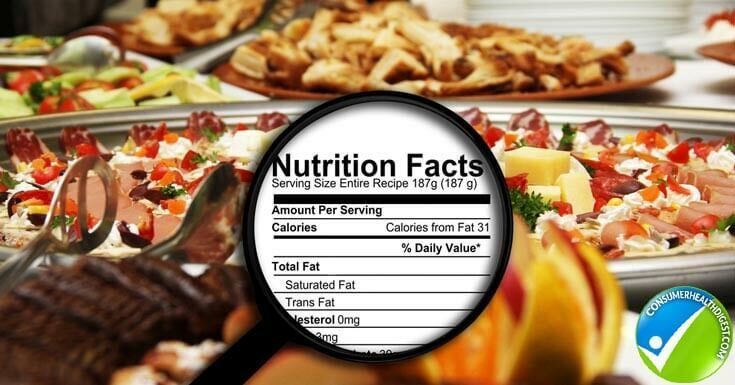 You can look at a Nutrition Facts Panelto see the total amount of fat, trans fat and saturated fat contained in foods. The Dietary Guidelines for Americans 2015-2020 say “Limit calories from added sugars and saturated fats and reduce sodium intake. Consume an eating pattern low in added sugars, saturated fats, and sodium. Cut back on foods and beverages higher in these components to amounts that fit within healthy eating patterns.” This translates to “Consume less than 10 percent of calories per day from saturated fats.”So how can one try to consume less saturated fat and consume more healthy fat in a day? 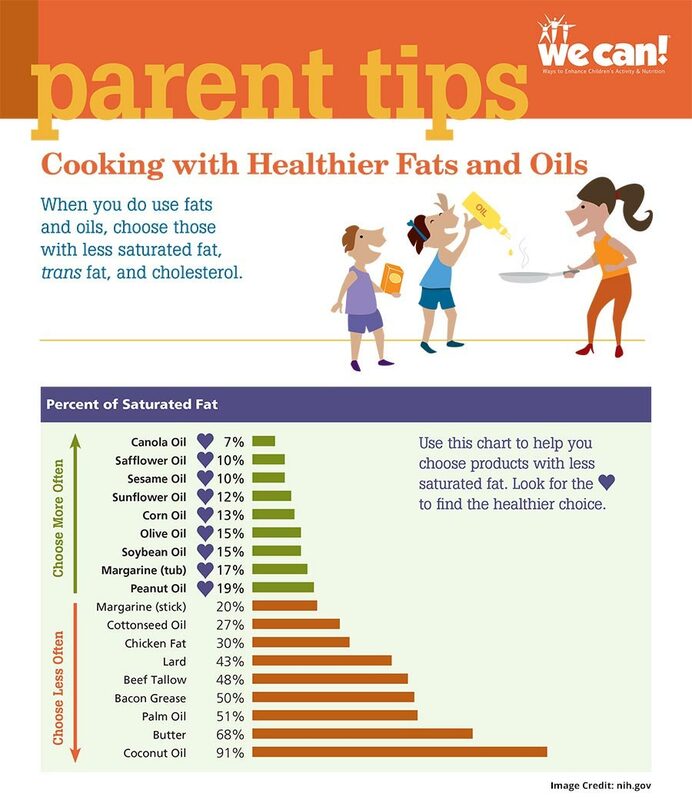 This chart shown below from the United States Department of Health and Human Services can help you understand what products have less saturated fat and improve the nutrition while cooking by adding healthier fats and oils! Monounsaturated fats (MUFA) are characterized by being liquid at room temperature. Foods that contain significant amounts of MUFA include olive oil, avocado, peanut butter, and almonds. Health benefits that have been associated with consuming MUFA include reducing the risk for heart disease. Polyunsaturated fats (PUFA) are also unsaturated and liquid at room temperature. The most common are alpha-linolenic acid (ALA, an omega-3 fatty acid) and linoleic acid (LA, an omega-6 fatty acid). Both of these fatty acids cannot be made by the body so are considered essential and must be obtained from food. Omega-6 fatty acids are important for heart health, are abundant in the diet and can be found in soybean oil, nuts, and seeds. There is scientific discussion as to the inflammatory or anti-inflammatory effect of too much omega-6 but current research points to the importance of omega-6 in the diet for optimal health. ALA comes from plant sources including walnuts, canola oil, flax, chia and hemp seeds and soybean oil. ALA is the precursor to important long-chain omega-3 fatty acids: eicosapentaenoic acid (EPA) and docosahexaenoic acid (DHA). Consumers can get good amounts of EPA and DHA from fatty fish which include wild-caught salmon, herring, mackerel, and trout. The United States Dietary Guidelines 2015-2020 emphasize eating 8 ounces of fish a week. Unfortunately, many of these types of fish are not consumed much in the American diet. Consumers should also consume ALA, which is found in the more commonly consumed food such as walnuts, flaxseed, and canola oil. A recent review paper shows that all omega-3s are necessary for good health, especially heart health. 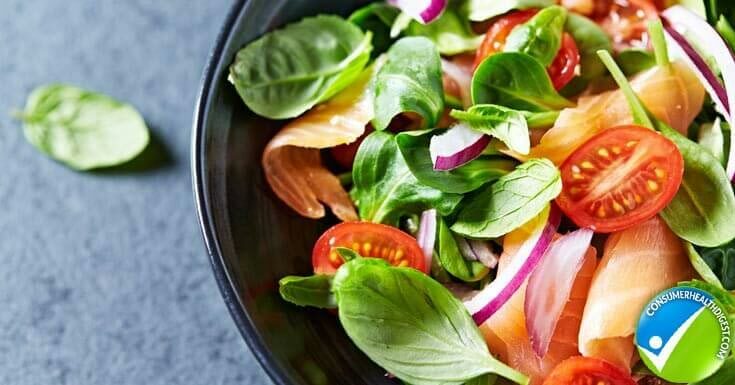 Instead of chicken salad, make a salmon salad, using canned salmon. Use ground flaxseed (flaxseed must be ground for if eaten whole it acts as a laxative and does not provide bio-accessible ALA) as part of recipes calling for flour (muffins, breading, pancakes, etc.). Use canola oil when cooking, for example instead of using butter to cook an egg, use a ½ teaspoon of canola oil. Include walnuts as part of your protein portion for the day. How about walnut “chorizo“? This recipe (and photo) from the California Walnut Board provides a quick recipe that can be used as taco filling, in an omelet or frittata (using omega-3 eggs of course) or in a salad or wrap. Use omega-3 eggs. Not familiar? 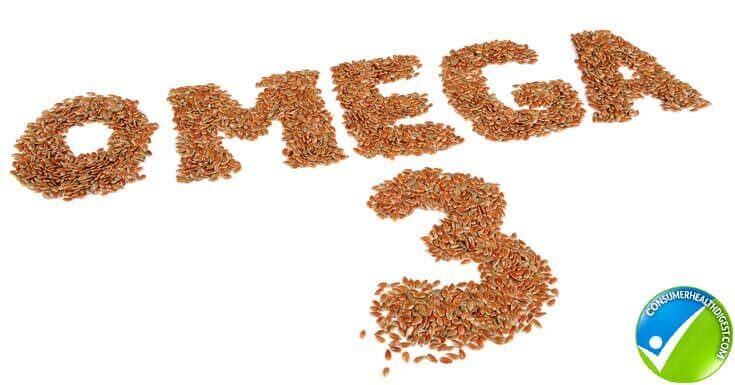 Omega-3 eggs are produced by hens that are fed a special diet that may include flaxseed. They may cost a bit more but are worth it. Sprinkle walnuts on salads, yogurt, cereal, or pasta dishes. Go Scandinavian for a day and buy some pickled herring and enjoy an open-faced sandwich. Place herring on top of pumpernickel bread that is spread with a canola-based margarine. Sprinkle parsley on top. Make your own salad dressing using walnut oil. An easy recipe: 2/3 walnut oil to 1/3 red vinegar. Add spices you like and use on your favorite salad. Understanding the important role that fat and especially essential omega-3s play in our diets is a key to good health. Research shows that all omega-3 fatty acids, both marine, and plant-based sources should be consumed for optimal health.